The indoor area has games and activities specifically tailor-made to stimulate interest, sensory perception and creativity in children by allowing them to play with educational toys, soft toys and equipment geared towards everyday fine motor skills, gross motor skills and intellectual development. They use pretending or imaginative play to transport themselves into another world. They engage in role playing and dress up as doctors, pirates, princesses and ballerinas all the while developing social and communication skills. Children love the outdoors! They embrace the freedom and open space. We provide a safe and well-resourced outdoor play area with mini houses, bicycles, tricycles, a see-saw, a swing, a slide and a climbing frame. Outdoor play boosts physical development and confidence. It is a time that allows forexperimenting with different roles and allows them free time to engage with their peers. The outdoor area is well-shaded and specially designed to engage, excite and enthral kids, thereby improving their physical development and social behaviour. Children are enthralled to play in water as it delights their senses and fosters their curiosity and imagination. A water play-area promotes constructive and dramatic play that is important for the overall development of children. Water play is good for children’s physical, cognitive and social-emotional growth. This type of sensory play improves vocabulary, hand-eye coordination and fine motor skills; and provides opportunities for creative thinking. Children enjoy one hour long water play session per week during the autumn and spring seasons at Kids Palace Nursery. Sandpit offers sensory play that invites participation and permits children to make and test theories; stretches their imagination and provides a potentially soothing sensory experience. Sandpits encourage the imagination and creativity of children by providing the materials and space to build structures such as sandcastles; dig holes and bury toys. A sandpit therefore provides a medium in which children can explore, construct, and experiment in three dimensions. 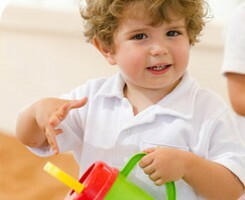 It is an excellent avenue for children to learn physical, cognitive and social skills. Sand pit play is open-ended and the child determines the path and direction of his or her own play. This freedom then clears the way for the child to build developmental concepts. Reading is one of the most important tasks every child must undertake during the learning process. If children develop their reading and comprehension skills, they will be able to succeed in school and in everyday life. At Kids Palace Nursery, there is a library specially set up to encourage the habit of reading in every child. This unique feature was added in coherence to our holistic approach towards early childhood learning. Children are surrounded by technology in the immediate environment and would even be adept in operating a few electronic devices. The Foundation Stage curriculum for this area of learning emphasizes on children continuing to find out about the purposes of ICT in the ‘real world’. Teaching ICT in preschool is very important as it sets the tone for the use of computers and technology in schools. ICT is an integral part of early learning that uses appropriate expertise to provide opportunities that develop independent learning skills in children. Apart from imparting technical literacy, it also improves creativity and learning through exploration. Each class at Kids Palace Nursery has two ICT sections per week, supervised by a professional class-room teacher. We believe that good, sound sleep is an absolute necessity for the children to participate in our activity-based curriculum. Our understanding of balanced lifestyle translates into careful designs that suit each activity of the nursery. The carefully structured sleeping area with attractive interiors, comfortable cots and soft beds create the perfect ambience for children, making them feel happy and relaxed as they take their rest. We have a clinic on site with a full-time nurse. The clinic is open from 7.30am until 4.00pm. We also have a Doctor who visits once a week to carry out routine check-ups on all children and who is available as a point of reference in the event of any particular queries or concerns.